With the rest of the world (okay, mainly just audiophiles' forum) still arguing whether Westone 3, Sennheiser IE8, UE Triple.fi 10 or Shure SE530 (or ...fill in the name you like...) is the current best universal IEM in the market, my attention switched to China as there was a new IEM being released in their local market last week. The thing about Chinese headphone is they never really make much name oversea (and usually limits to audiophiles' community), but don't let that fools you. The truth is we have seen many high quality headphones coming out of China over the last few years, and the trend will very likely to continue for a while. 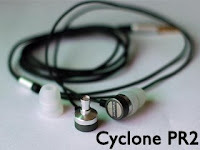 Cyclone PR2, the second IEM under the Cyclone brand name. This IEM (along with its elder brother, the PR1, released early this year) is manufactured by the same company which made the Storm amp. Unfortunately it is unlikely we will see it being sold oversea as the company seems to limit its business to the China local market (as are many good headphone companies in China). MSRP RMB380 (*roughly US$55.60). 3 pairs of single silicone flange ear-tips (2 small, 2 medium, 2 large), Foam ear-tip and bi-flanges ear-tips. Optional resistance cable (51 ohms) for extra sound quality.